An affiliate of Star Shuttle, Star Coach Express is among the many emerging bus operators in the travel industry. Their coaches are designed to spoil passengers with a peaceful, safe and comfortable travel experience. Similar to Star Shuttle, it provides many trips from various parts of Peninsular Malaysia to tourist attractions across the land. Among them include, to destinations such as Johor Bahru, Kuala Lumpur, Alor Setar and more. They operate at various terminals and stations as well, all located at a strategic locations making it easily accessible for their fellow passengers. 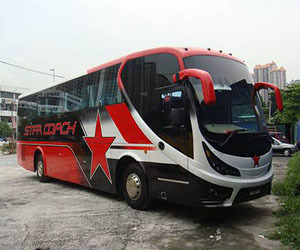 Star Coach Express is currently gaining momentum in term of popularity amongst fellow bus travelers both local and foreign. Jalan Tiong Off, Batu 3, 51200 Kuala Lumpur. Counter D6, Aman Jaya Integrated Terminal. No. 618-G, Jalan Teluk Intan 3, Bandar Baru Teluk Intan, Perak. CatchThatBus offers online bus tickets to many routes covered by Star Coach Express as well as seat availability features. You can book your bus ticket online from our website or via mobile app which can be downloaded for free on Google Play or App Store.